I have a confession to make, I admire the way one can smell a new season. I soak it all in while strolling through the woods, similiar to eating with all my senses I like to be very conscious and sensible in nature. Smelling the fresh yet colder air, new plants, listening, touching and gazing. It is a way to connect and ground myself. I am aware that it makes me look like a total hippie but I don’t care. It makes me happy and keeps me inspired. 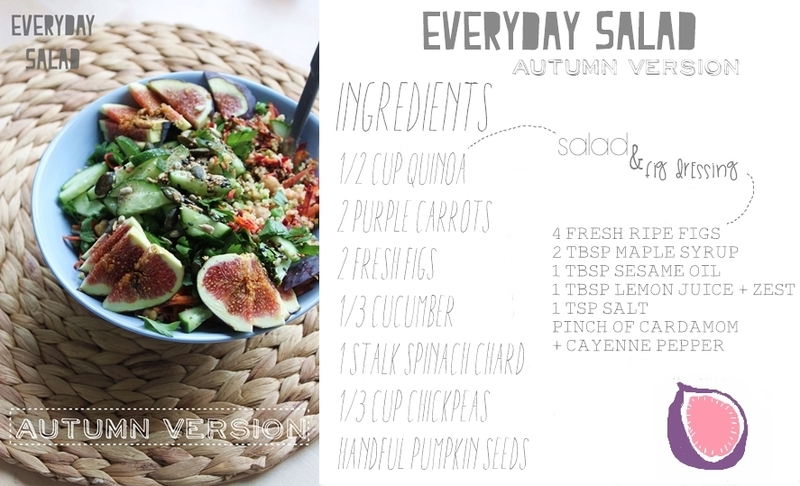 Since fall is my favourite season of the year I wanted to show you guys a simple everyday salad which changes a little bit depending on the season. Figs are the fruits of autumn! And they are everywhere in my house right now. As long as I can get them, I will. The ripe fresh fruits are juicy, wholesome and so darn delicious! Figs are among the most alkaline fruits, containing fiber and potassium aswell as calcium and iron. A healthy sweet little treat which can be your friend too! Rinse the quinoa, cook it for 15 minutes on low heat in 1 cup water. Shred the carrots, cut the figs, cucumber and the green part of the chard in thin slices. Roast the pumpkin seeds for a few minutes. Let them cool down a bit. Add chickpeas and combine everything in a bowl. Toss around carefully with clean hands. Mix all of the dressing ingredients together in a food processor. Pour over the salad! Most important part – ENJOY! How do you connect to nature/seasons? With a particuar food? Smell? Activity? Tell me three things in the comments. & Meet me here or hop over there! I am curious to meet you! A recipe made by me is featured in the next issue of chickpea magazine. I am beyond proud and honoured to be part of such an amazing magazine! 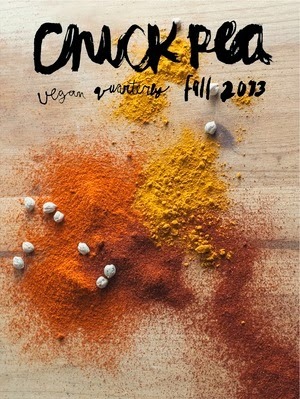 I love their style, photography, message & recipes! It’s a quarterly season inspired vegan magazine with stunning photography, food and texts. Without any ads and made on the softest, robust paper. It has such a unique quality and beauty – my eco/hippie/foodie/crazy/euphoric heart jumped the first time I came across one of their issues. Let’s celebrate fall, the issue, chickpeas in general ( why not?!) & my recipe! I hope you’re gonna love it as much as I do! YAYAYAYAYAYAY about chickpeas! That is s exciting. And no wonder, because this looks totally delicious and wonderful. I love the ingredients. Great work, I can't wait to see it!